Checking the logical condition is done using the If-Then-Else structure. It starts with the command If, followed by a logical condition that is formed in the same way as in Excel. Next follows the command Then, aftwer which goes the part of the code to be executed if the condition is met. Optionally, Else command can be specified, followed by a part of the code that is executed if the condition is not met. The structure ends with an End If command, which is not necessary if there’s only one command after Then. Let’s start with showing the simplest way of applying the If-Then structure. When we examine several conditions, it is possible to form the nested If-Then structure. 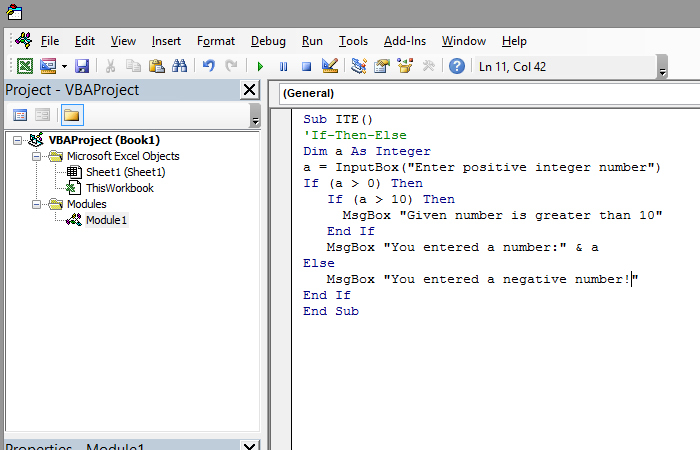 The program we wrote first expects to enter a positive integer number. If it is greater than zero the second condition examines whether it is greater than ten and gives a message. Then, as a default, appears a message about a number you’ve entered. If the number entered is less than zero, the message about entering a negative number is displayed.